Get the best value for your money when you book Royal Hawaiian Limousine’s car services. Our professional VIP car services cover many, if not all transportation needs you may require while you’re in Hawaii. We take pride in providing the finest chauffeured car transfers that are not only luxurious, but also safe and comfortable. Treat yourself to a secure and comfortable ride with our selection of reasonably-priced car transportation packages. We have the finest selection of vehicles; from a luxury Mercedes Benz Sprinter, luxury sedans and SUVs to mini vans. Luxury F550 Bus – The newest addition to our fleet is the spacious and Luxurious F550 Bus from Ford which gives top-knotch comfort and brings our transfer service to another level. Designed to satisfy your need for VIP car services with maximum space for extra passengers and luggage. Luxury Mercedes Benz Sprinter – We take style and sophistication to a whole new level with our Luxury Mercedes Benz Sprinter transfer service. Designed to satisfy your need for VIP car services with enough space for extra passengers and luggage. Without comprising class and comfort, of course. Luxury Sedan – Whether you’re in Hawaii for leisure or business, our luxury sedan transfer service would be perfect for either a luxurious travel experience or to impress your clients. Our luxury sedan is available for Honolulu Airport transportation, dinner transfers, hotel transfers, and more! Executive Sedan – Treat yourself to a luxury car transportation in Honolulu with RHL’s executive sedan service! Enjoy comfortable transfers from or to the airport, dinner, hotel, and other destinations. Sedan – Avail yourself of our sedan car services and enjoy quality transportation in and around Oahu. We’ll make sure you’ll have a safe and comfortable transfer at a very fair price. Our sedan car service will be perfect for all your hotel transfer and airport transfer needs. Executive SUV – When looking for the most luxurious transportation, better check out our elegant selection of cars that can provide you with the finest car service in Honolulu. Savor Royal Hawaiian Limousine’s extra touch of class as our professional chauffeurs drive you to your desired Oahu destination in style. Mini Van – Are you vacationing with your family in Hawaii and could use a more spacious vehicle? Well then, our minivan service will be perfect for you. Our quality minivan service is sure to provide you and your family or friends with a secure and cozy transportation. Van – RHL offers a full range of Hawaii van services for all your transportation needs including hotel, dinner, and airport transfers. Enjoy easy and secure Waikiki van transfers that highly considers your personal needs. 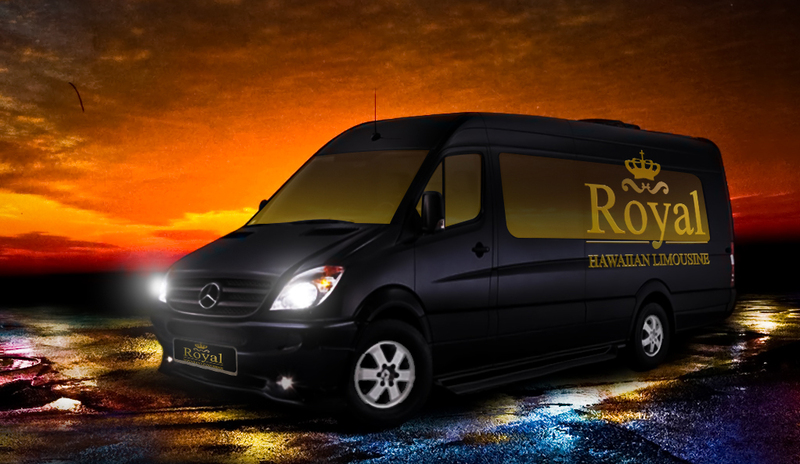 Experience Hawaii with the best car services in Honolulu that only Royal Hawaiian Limousine can offer. Book our car transportation service today!